In his second of three seasons as BSO Artistic Partner, Thomas Adès has been collaborator-in-chief, bringing his superior skills as pianist, conductor, curator, and educator to Tanglewood ubiquity. 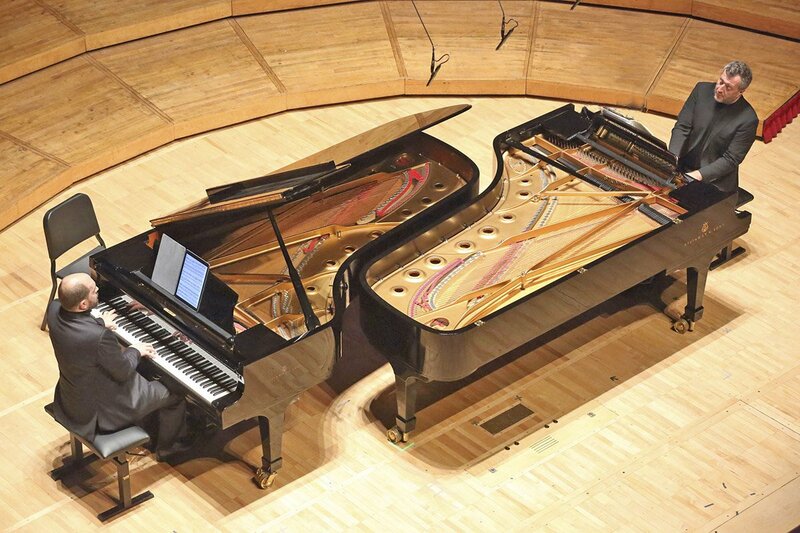 Wednesday night at Ozawa Hall witnessed his partnership at two pianos with 2018 Koussevitzky Artist Kirill Gerstein. The well-curated program (presumably Adès’s doing) detoured from a stimulating span (1901-1941) of French and Russian modernists to showcase his own two-piano Lisztian concert paraphrase of his opera Powder Her Face. Throughout the evening Adès played with technique and imagination both approaching the incredible, goading his partner Gerstein and keeping the audience in lively accord. As a pianist, he composes some intensely interesting sounds. In his opera transcription in particular, we imagined his 10 fingers as a gabby coterie of independent voices, although without human voices and instrumental colors, the very technical writing left any lyrical stage imagery taking a powder. Stravinsky’s Symphony of Psalms, one of Koussy’s most beloved commissions for the BSO, made its appearance in a two-piano transcription Shostakovich undertook in the late ’30s, for performance with his son, we understand. The neoclassical exercise for orchestra without upper strings depends on gorgeous wind sonorities to dress up its sharply etched structures. Shostakovich’s take brings the counterpoint into clear focus without pretending to evoke continuous tones. It comes across as a classroom exercise by a clever pianist-teacher giving a learned gloss to his keyboard partner. This supercold and analytical execution seemed secure in every note and blessedly clean. Beginning with the opener, Debussy’s En blanc et noir (1931), we experienced a bit of cognitive dissonance between the primo of Adès and the secondo of Gerstein (we know those terms are inapt). Gerstein is a merry bear at the keyboard, tearing into juicy repertoire and relishing virtuosic challenges. We don’t think of him as Frenchified. He did enter this frothy soundworld with glittering restraint. The players listened to each other and for the most part coordinated with accuracy. Adès’s high-wire, high velocity urgings, in the Scherzando of the Debussy, at the ends of Lutoslawski’s barroom-brawl Paganini Variations, and the “Feria” movement from the closer, Ravel’s Rhapsodie espagnole, seemed to make Gerstein break out in one or two beads of perspiration. But in this Debussy, difficult even for an established team, the virtuosic pair absolutely captured Debussy’s mood of studied caprice. Debussy’s 1901 Lindaraja finds the composer in his own espagnole sensibilities, anticipating many of the subsequent, better-known expressions in that exotic style. It fit into this artfully conceived program with inevitability. Gerstein’s jazzy persona here evoked mantillas. The stretching of the beat and other artful rubatos in this extravagance gave this writer particular pleasure. Both pianists combined cool rigor with bravura, individually emoting with bold and audacious sweep, collectively rather less so. Fortunately for those of us stuck in the hot city, Thomas Adès and Kirill Gerstein will be repeating this program in Jordan Hall on Friday, March 15, 2019. It’s being presented jointly by the Celebrity Series and the BSO.